The Standard Model (SM) of elementary particles has numerous successes. Its latest famous success is the discovery of the Brout-Englert-Higgs boson. However, the SM has also some issues. For example, the SM particles are only responsible for about 5% of the Universe content. The remaining 95% are unknown and labelled dark matter and dark energy. Many extensions of the SM have been build to tackle one or several of those issues but no physics beyond the SM has been observed so far despite the numerous dedicated searches. My research aims at finding new ways to search for new physics by proposing new measurements for existing and future experiments. 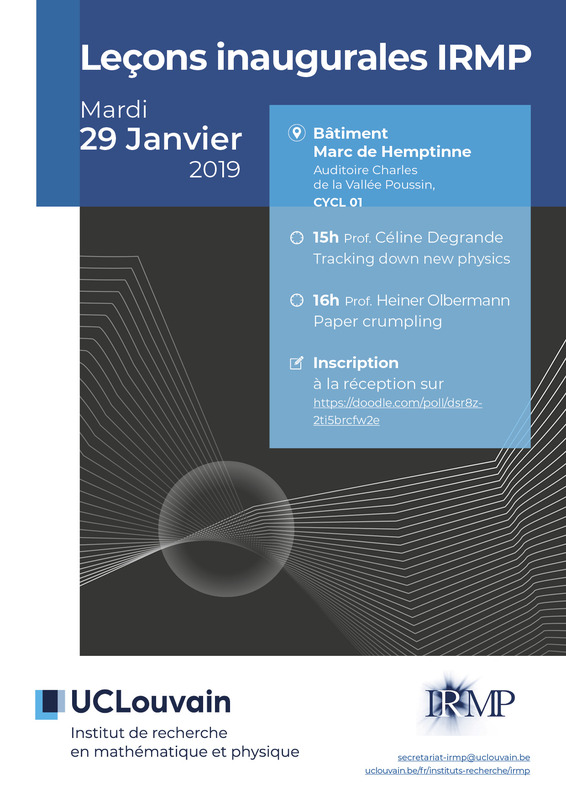 In this talk, I will present new observables sensitive to new physics at colliders and in astrophysics. When crumpling a thin elastic sheet (think: a piece of paper), one observes the emergence of an intricate pattern of regions where the deformation energy focuses. The rigorous analysis of these patterns turns out to be a very difficult and interesting problem, linking nonlinear elasticity, the calculus of variations and differential geometry. A large part of my scientific work can be linked in some way or other to this setting. In this talk, I will present the current state of the art, including some of my own results.